True Blues are quite possibly the most comfortable pair of household gloves you will ever own. 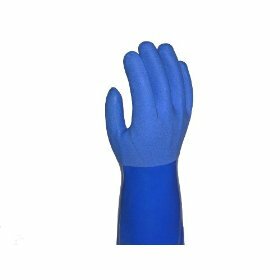 Their tough vinyl shell, generous cotton liner and snug fit allow True Blues to resist hot water and household chemicals saving your hands from drying and cracking. Because True Blues are vinyl, they won't crack like regular latex gloves. True Blues are latex free and are machine washable making them the only household gloves you will ever need. Available in small to extra large.